Mozart's famous Eine Kleine Nachtmusik is followed by an evocative version of Boccherini's Nights in the Streets of Madrid written specially for the Cathedral Orchestra by Adam Webster. The local young soprano, Julia Smith, sings Berlioz's ravishingly romantic songs Summer Nights (Les Nuits d’Été) . Music by his contemporary, Mendelssohn, concludes the concert: excerpts from the pieces he wrote for Shakespeare's play A Midsummer Night's Dream. This is an concert full of the romance of a summer's evening. There is more romantic music on October 12, notably Bruch's Violin Concerto. 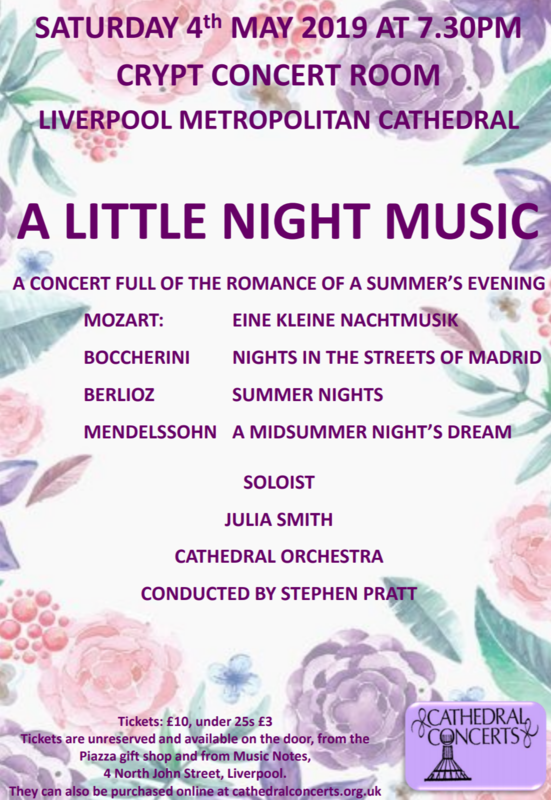 Mozart's famous Eine Kleine Nachtmusik is followed by an evocative version of Boccherini's Nights in the Streets of Madrid written specially for the Cathedral Orchestra by Adam Webster. The local young soprano, Julia Smith, sings Berlioz's ravishingly romantic songs Summer Nights (Les Nuits d'Été) . Music by his contemporary, Mendelssohn, concludes the concert: excerpts from the pieces he wrote for Shakespeare's play A Midsummer Night's Dream. This is a concert full of the romance of a summer's evening. This wide-ranging concert contrasts some wonderful choral music with several of the most famous pieces for strings, such as the famous Canon by Pachelbel. The vocal music includes Duo Seraphim for two choirs by Gallus; the Merseyside premiere of the last completed piece by Sir Peter Maxwell Davies, The Golden Solstice; Avo Pärt’s Bogoroditze Dyevo (Hail, Mary) - and his violin version of Spiegel im Spiegel (Mirror in the mirror) - and two exquisite pieces by Morten Lauridsen. This is a concert not to be missed. There is more choral music on November 9, with works by Bach, Handel, Mozart and Fauré among others. The Lark Ascending is one of the most popular pieces in English music. It shares the concert with Benedicite, another richly expressive work by Vaughan Williams, and lyrical orchestral miniatures by Delius. There are folk-song settings, including a new one by Mike Stubbs and two extended items by local composers: Hilary Burgoyne’s wonderful On a Strange Shore, with Mary Bowell on ‘cello, and the haunting Death and the Maiden by John Moseley. Beth Hartless is the soloist in this while Patricia Heyes, so well-known to Merseyside audiences, is the solo soprano in Benedicite. ​For those who love the violin, Bruch’s Violin Concerto is being played, again by Leo Byrne, on October 12. Is there a more expressive violin concerto in the repertoire? As played by the leader of the Cathedral Orchestra, Leo Byrne, this will be a very special performance. It shares the concert with two of Schuman’s mature masterpieces: his interpretation of Byron’s Manfred and the evocative Rhenish Symphony. This is a feast for all lovers of romantic music. ​Our next concert, on November 9, includes romantic choral music by Fauré, Franck, Stanford and Parry. This is a must for lovers of choral music. Ranging over three centuries, many of the great pieces by Bach and Handel, Fauré and Franck Parry and Stanford are here, interspersed with organ works. This is a feast of well-loved classics: Hallelujah Chorus; Widor’s Toccata and many more. Joining the Cantata Choir and Orchestra are two excellent local children’s choirs from Carleton House School, Liverpool and English Martyrs School, Litherland.